Move the Body to Boost the Brain! Have you ever wondered what is helping you sit upright in your chair without falling over and allowing you to control a pencil in your hand effectively to write or draw? It is the “sensory-motor” part of your brain. Often unknown to many of us, this brain fitness area is working quietly and continuously, supporting our daily lives and activities without us needing to put in extra effort. Our sensory-motor brain fitness helps us to hold an egg gently in our hand without breaking it, as our brain automatically judges and fine-tunes the force we exert with a fragile item like an egg. Different sensors in our body provide continuous feedback to our brain so that we can naturally use the right amount of force and correct movement patterns to accomplish various activities. Whether it is to walk down the stairs in a dark movie theatre without falling over, manipulate the pen in our hand with refined control as we write, or swing the tennis racquet to hit the ball back to our opponent, our body sensors gather feedback and rapidly inform our brain about where we are and what we are doing so that our muscular system can effectively perform the tasks. These body sensors include our sense of touch, balance and joint position awareness. They must provide the brain with accurate information about our body so that the brain can relay this information to our muscles to execute an appropriate movement. In addition to helping us with these important daily functions, our sensory systems also help us to regulate our state of arousal, moods and attention, all vital for success in learning and in school. For a long time, we all thought that one’s sensory-motor abilities could only affect our physical or sporting performance. Recent research has shed light on the intimate relationship between our sensory-motor functions and cognitive learning abilities. In a recent study presented at the annual meeting of the Society for Neuroscience in November 2010, researchers secured weights to the tails of a group of rats and had them climb a ladder five sessions a week. Other rats ran on a treadmill, also for five sessions a week, while a third group of rats just sat around. After eight weeks, the running rats had much higher levels of brain chemicals that are important for the growth of new brain cells. The same elevation of such growth-inducing brain chemicals was also seen in the group of rats with weights tied to their tails. The sedentary rats, however, had no such increase. The weight-­bearing rats, like the runners, did well on tests of learning and memory, like rapidly negotiating a water maze. Both endurance and weight training seemed to make the rats smarter. This study adds to the long list of animal studies which have found exercise to enrich the brain and increase learning abilities. What about children? Does movement and exercise make our children smarter too, like they do in animals? Absolutely! Recent research studies have found a relationship between movement, exercise and cognitive abilities in children. 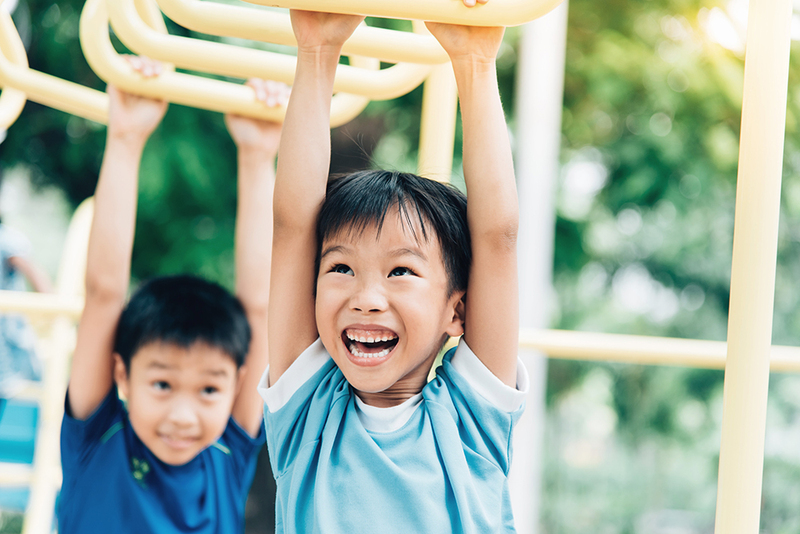 Increased physical fitness levels in children have been found to be correlated with a higher IQ, better memory, increased attention and faster reaction times. Using brain scan technologies to understand these relationships, scientists have found that physically fitter children have a larger hippocampus (the area of the brain important for memory formation) and a larger basal ganglia (a key part of the brain that aids in maintaining attention and “executive control,” or the ability to coordinate actions and thoughts crisply). 1. Include in your child’s daily routine time for physical activity. Whether it is playing in the playground, playing a formal sport or just kicking a ball in the park, any physical activity will have beneficial effects on the brain compared to a completely sedentary routine. Remember that humans are made to move so many of our key organs respond favourably to movement! 2. Outdoor physical play is especially useful for very young children and preschoolers, as the external environments provide a rich source of sensory exposures to our little ones. Playing in the sand pit, picking up twigs and dried leaves and running barefoot in (clean!) grass all offer nice sensory inputs to our children to further enhance the development of their touch sensors. To build physical stamina, swimming or soccer may be good options. To build body coordination, sense of timing and rhythm, dance and gymnastics are good options. To build focus and core stability, martial arts classes may be useful. To build eye-hand coordination and reaction speed, ball sports are the obvious choices. Team activities like soccer offer more opportunities to develop social skills, teamwork and collaboration skills compared to solo activities. 4. When choosing a sport, do you decide based on your child’s strength or weakness? If your goal is to nurture your child to become a professional athlete, the choice is obvious to choose based on your child’s strengths. If you, like me, are more concerned about using the precious early years to remediate any cognitive weakness, then choosing an activity that gives your child more practice opportunities in his or her areas of weakness may be beneficial. In either case, remember that it is vital to be led by your child’s interest since you would not want your child to ever associate any physical activity with “dread”. 5. Exercise as a family! Remember that physical activities have benefits for both adults’ brains as well as children’s brains. Going for a jog together or playing frisbee in the park together is a great activity that not only boosts all family members’ brains but also brings the family closer together!